CHICAGO – The news of Steve Carell’s departure from NBC’s “The Office” after this upcoming season led to much debate as to whether or not the incredible sitcom could survive without its award-worthy star. That discussion probably won’t end until a replacement is named to run Dunder-Mifflin but you can check out the great sixth season, now available on Blu-ray, to form your own opinion. Universal TV Blu-rays (which also include “Heroes,” “House,” “Battlestar Galactica”) are things of beauty. The video/audio transfers, interactive functionality, and special features are always better-than-average. Even with that leadership, they’ve topped themselves with “The Office” by integrating the technology with the trend of TV downloading. 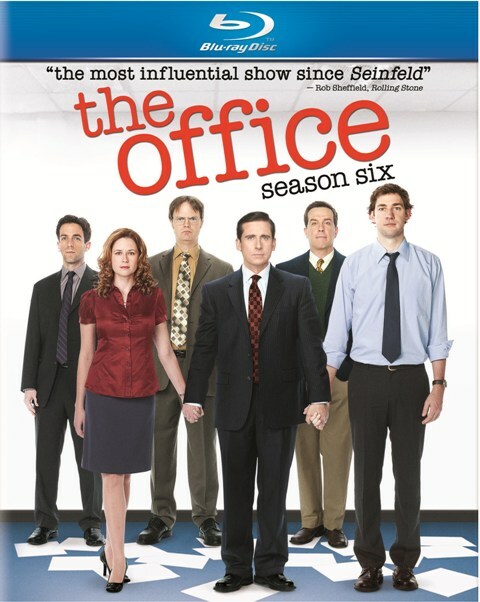 In a remarkable new function, anyone with a BD copy of “The Office: Season Six” and an internet-capable player can watch the five most recently-aired episodes from season seven in HD. So, buying the last season will keep you up-to-date with the new one. It’s a brilliant idea that I expect will be copied soon or at least it should be. As for the show itself, the sixth season of “The Office” may not have been quite up to the fifth (which I think was arguably the best) but it did feature some spectacular highlights including Pam’s wedding and the birth of her child. The inclusion of new management through a recurring guest role by Kathy Bates didn’t quite work but the arc did get the great Craig Robinson more screen time. And, honestly, any complaints or criticisms about slightly sub-par episodes or seasons of “The Office” feels a bit like a waste of time. “The Office” has been one of the most consistent and impressive programs of the last ten years, period. There’s no debate. And the Blu-ray release is a beauty as well. The video transfer looks just as polished as NBC’s original airing, which fans with HD televisions will know is above-average. As for special features, Universal has long been pushing interactivity through functions like U-Control and BD-Live and “The Office” includes the aforementioned episode downloads, more bonus content available through BD-Live, and Pocket Blu — the integration of smartphone and BD that I’m still not quite convinced makes for a solid partnership but will surely appeal to some viewers. Other special features include an original digital short, blooper reel, two hours of deleted scenes, “Welcome to Sabre Video” company video, and more. The role of a sixth season TV release is simple — don’t break the pattern. No one is starting with the sixth season of anything, so the question is does it live up to previous releases or should you stop your collection at five? The future of the show may be unclear but there’s no point in stopping your Blu-ray collection now. ‘The Office: Season Six’ stars Steve Carell, Jim Krasinski, Rainn Wilson, Jenna Fischer, Ed Helms, B.J. Novak, and Craig Robinson. The five-disc sixth-season set runs 604 minutes and was released on September 7th, 2010.